Babycapes Review & Giveaway - Mom Made That! ::GIVEAWAY CLOSED:: Congrats to Erin Tales! I know you have heard me say, many times before, that moms are the best inventors, and they truly are. When we see a need for a product, we just create it! I love that moms are so innovative, and I LOVE the mom-inventedBabycapes! I believe the best, and most important, feature about this product is being able to buckle my child into his car seat, without a big coat on, and just placing the cape over everything. According to the National Highway Transportation Authority, you should “always remove bulky clothing or blankets before you place your child in the seat.” The Babycape makes it much safer for your child to travel by car during the cold months, which, alone, makes it worth the $39*-$59* investment. I tried it out on a cold day and it took little effort to buckle my son into his seat, and then drape the Babycape over him. Not only was he super warm and safe, but he looked adorable! Babycapes are assembled in the USA, and are made of super soft fabrics. 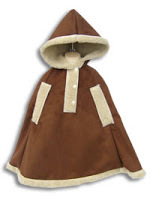 I love the suede on the outside of my Babycape, and the inside fabric is so warm and cozy-it’s like having your favorite blanket wrapped around you! There are three fabrics to choose from-Minky Sherpa Suede (heaviest weight), Minky Marshmallow (softest fabric), and Minky Cuddle (lightest fabric). There are two slits in the front of each cape for older babies or toddlers to have their hands free, which worked well for my son to drink his bottle and play with toys while sitting in his car seat. One size fits all, so you don’t need to buy a winter coat for years! That, too, is worth the investment. Can you tell I love Babycapes??? Want one for your little one now? Then, please visit www.babycapesonline.com and order your own! They are currently having an awesome Amercian Economic Recovery Sale, so you can receive a GREAT DEAL if you order now. I would like to thank Babycapes for letting me test out your product, we truly appreciate it! ::GIVEAWAY::Babycapes would like to give one lucky winner a Babycape! To enter, simply visit the Babycapes site at babycapesonline.com come back here and leave us a comment, telling us what color and style you would pick if you won! Send a tweet here about this giveaway. (mention in comment) You can also follow us on Twitter here. Giveaway ends 6:00 p.m. CST on March 4th, 2009. USA residents only please. Good luck!